The Massachusetts General Court (formally styled the General Court of Massachusetts) is the state legislature of the Commonwealth of Massachusetts. The name "General Court" is a hold-over from the earliest days of the Massachusetts Bay Colony, when the colonial assembly, in addition to making laws, sat as a judicial court of appeals. Before the adoption of the state constitution in 1780, it was called the Great and General Court, but the official title was shortened by John Adams, author of the state constitution. It is a bicameral body. The upper house is the Massachusetts Senate which is composed of 40 members. The lower body, the Massachusetts House of Representatives, has 160 members. (Until 1978, it had 240 members.) It meets in the Massachusetts State House on Beacon Hill in Boston. The current President of the Senate is Karen Spilka, and the Speaker of the House is Robert DeLeo. Since 1959, Democrats have controlled both houses of the Massachusetts General Court, often by large majorities. The Democrats enjoyed veto-proof super-majorities in both chambers for part of the 1990s (i.e., enough votes to override vetoes by a governor) and also presently hold supermajorities in both chambers. State Senators and Representatives both serve two-year terms. There are no term limits; a term limit was enacted by initiative in Massachusetts in 1994, but in 1997 this was struck down by the Massachusetts Supreme Judicial Court, which ruled that it was an unconstitutional attempt to provide additional qualifications for office by statute, rather than constitutional amendment. The legislature is a full-time legislature, although not to the extent of neighboring New York or some other states. As of 2018, the General Court was composed of 75 percent male and 25 percent female representation. Each Representative represents about 41,000 residents. The speaker of the House has historically been quite powerful, exerting significant influence over all aspects of state government. Representative districts are named for the primary county in which they are located, and tend to stay within one county, although some districts contain portions of adjacent counties. The current composition of the House is 127 Democrats, 32 Republicans and 1 Independent. There are 40 senatorial districts in Massachusetts, named for the counties in which they are located. Each state Senate district contains about 164,000 constituents. The current composition of the Senate is 34 Democrats and 6 Republicans. The General Court is responsible for enacting laws in the state. The two legislative branches work concurrently on pending laws brought before them. Lawmaking begins when legislators, or their delegates, file petitions accompanied by bills, resolves or other types of legislation electronically, using the Legislative Automated Workflow System (LAWS). The electronically submitted legislation is received in the House or Senate Clerk's office where the petitions, bills, and resolves are recorded in an electronic docket book. The clerks number the bills and assign them to appropriate joint committees. There are 26 of these committees, each responsible for studying the bills which pertain to a specific area (i.e., taxation, education, health care, insurance, etc.). Generally, each committee is composed of six senators and eleven representatives. The standing committees schedule public hearings for the individual bills, which afford citizens, legislators and lobbyists the opportunity to express their views. Committee members meet at a later time in executive session to review the public testimony and discuss the merits of each bill before making their recommendations to the full membership of the House or Senate. Note that the public may still observe "executive" sessions, but may not participate in these meetings. The committee then issues its report, recommending that a bill "ought to pass" or "ought not to pass" and the report is submitted to the Clerk's office. The first reading of a favorably reported bill is automatic and generally occurs when the committee's report appears in the Journal of the House or Senate. Matters not requiring reference to another Joint, House or Senate committee are, following the first reading, referred without debate to the Committee on Senate Rules if reported in the Senate, except certain special laws (relative to a city or town) are placed directly on the Senate Calendar (Orders of the Day), or, without debate to the House Steering, Policy and Scheduling committee if reported into the House. Reports from Senate Rules or House Steering, Policy and Scheduling are placed on the Calendar of the Chamber receiving the report for a second reading. If a bill reported favorably by a joint committee affects health care it is referred by the House or Senate Clerk to the joint committee on Health Care Financing; and the first reading is delayed until the next favorable report, thus allowing Health Care Financing to report to either the House or Senate. The Health Care Financing Committee is required to provide an estimated cost of the bill, when making their report. If the estimated cost is less than $100,000, the bill bypasses having to be referred to Ways and Means. If a bill is not related to health care, but affects the finances of the Commonwealth, or, if it is reported by the Health Care Financing Committee with an estimated cost greater than $100,000, it is referred to the Senate or House Committee on Ways and Means after the first reading. Adverse reports ("ought not to pass") are also referred to the Committee on Steering and Policy in the Senate or placed without debate in the Orders of the Day for the next session of the House. Acceptance by either branch of an adverse report is considered the final rejection and the matter of the matter. However, an adverse report can be overturned. A member may move to substitute the bill for the report, and, if the motion to substitute carries, the matter is then given its first reading and follows the same procedure as if reported favorably by committee. After a bill takes its second reading, it is open to debate on amendments and motions. Following debate, a vote is taken and if the bill receives a favorable vote by the membership, it is ordered to a third reading and referred to the Committee on Bills in the Third Reading. This amounts to preliminary approval of the bill in that branch. That committee examines technical points, as well as the legality and constitutionality of the measure, and ensures that it does not duplicate or contradict existing law. The committee then issues a report and returns the bill to the House or Senate for its third reading. At that time, legislators can further debate and amend the bill. Following the third reading, the body votes on "passing the bill to be engrossed." The bill must then pass through three readings and engrossment in the second legislative branch. Should that occur, it is sent to the Legislative Engrossing Division where it is typed on special parchment in accordance with the General Laws. However, if the second branch passes an amended version of the bill, the legislation returns to the original branch for a vote of concurrence in the amendment. If concurrence is rejected, a conference committee consisting of the three members from each legislative branch representing both political parties may be formed to effect a compromise piece of legislation. When a compromise is reached, the bill is sent to both legislative branches for their approval. A vote "to enact" the bill, first in the House and later in the Senate, is the final step in the passage of a bill by the legislature. Following enactment, the bill goes to the governor, who may sign the bill into law, allow it to become law without signing it (if the governor holds the bill for ten days without taking any action while the legislature is in session, it becomes law without his or her signature), veto it, or return it to the legislature with recommended changes. If the legislature has concluded its yearly session, and the governor does not sign the bill within ten days, it dies. This is referred to as a "pocket veto." This ten-day period includes Sundays and holidays, even if they fall on the tenth day, and it begins the day after the legislation is laid on the governor's desk. A bill signed by the governor, or passed by two-thirds of both branches over his veto, becomes a law. It is usually effective in ninety days. The day after the governor signs the bill is considered to be the first day, and each succeeding day, including Sundays and holidays is counted until the ninetieth. Laws considered "emergency" in nature take effect immediately upon signing if the legislature has voted to attach an "emergency preamble" to the bill. Adoption of the preamble requires a two-thirds standing vote of the membership. The governor may also declare an act to be an emergency law and make it effective at once. A special act takes effect thirty days from the day it is signed, unless it contains a provision to make it effective immediately. The current Massachusetts General Court has met as the legislature of the Commonwealth of Massachusetts since the adoption of the Massachusetts Constitution in 1780. The body was in operation before Massachusetts became a U.S. state on February 6, 1788. The first sessions, starting in 1780, were one-year elected sessions for both houses. This was expanded to two-year sessions starting with the 142nd General Court in January 1921. Thereafter, the legislative year was defined as: "The first legislative year starting with the opening of the biennial session and ends at midnight on Tuesday before the first Wednesday of the following year. The second legislative year starts on the first Wednesday of the second year and ends when the legislature prorogues or at midnight on Tuesday before the first Wednesday of the following year. Watson F. Hammond, seated in 1885, was the first American Indian to be elected to the body. The current 191st Massachusetts General Court will sit from the beginning of 2019 to the end of 2020. The Massachusetts Bay Colony received both a land grant from the previously chartered Plymouth Council for New England in 1627/8, and a royal charter in 1628/9. Under the Cambridge Agreement, the investors in the company who emigrated bought the shares of those who did not. This had the effect of giving the colony, as a corporation, local control (since all the shareholders were living on the colony's land) subject only to the English monarchy and not a board of directors in England. The charter made all shareholders (known as "freemen") members of the General Court, and the corporate board of directors of twelve freemen was known as the Council of Assistants. The Council also exercised judicial authority, and sat as a single body with the General Court for legislation. By votes of the General Court in the 1630s, the system of government changed to have an elected governor and to restrict the list of "freemen" to those affiliated with certain Puritan churches. In 1634, after complaint the charter was not being followed, a compromise resulted in recomposition of the General Court as two deputies elected by freemen in each town. Problems with a judicial case resulted in another reform in 1638, where the Council of Assistants became an upper house that sat separately, with consent of both houses required to pass legislation - a bicameral legislature. The Assistants heard appeals from small cases decided by county courts and local commissioners, and was the primary court for more important cases. After political strife with England, the Massachusetts Bay Colony charter was revoked by the king in 1684. The area was ruled by an appointed governor and council as part of the Dominion of New England until 1689. After the 1688 Glorious Revolution deposed the king, the Dominion collapsed and rule was seized by colonial leaders in an ad-hoc fashion. The Province of Massachusetts was created in 1691 under a new royal charter by combining Massachusetts Bay, the Plymouth Colony, and other lands. Over the objections of Increase Mather, the monarchs extended voting rights to non-Puritans, changing the qualification to owning land of a certain value. The General Court remained elected, but the governor, lieutenant governor, and judges were appointed by the crown. The General Court passed laws and chose the Governor's Council subject to the governor's veto. It had the power to appropriate funds, which allowed it to increase control relative to the governor over time. After conflict culminated in the Boston Tea Party, the British Parliament in 1774 passed the Massachusetts Government Act (later termed by American historians as one of the Intolerable Acts) which dissolved the General Court, made the Governor's Council appointed by the monarch, and allowed the governor to rule by decree and appoint town governments. In defiance of British law and governor, members of the General Court formed the Massachusetts Provincial Congress and seized control of the colony except for Boston, where the governor's troops maintained control until British troops fled Boston on March 17, 1776. The Governor's Council acted as the executive in the absence of the governor and lieutenant governor, administering the rebel forces of the colony during the early years of the American Revolutionary War, which began in Massachusetts at the Battles of Lexington and Concord on April 19, 1775. The General Assembly declared Massachusetts independent from Britain on May 1, 1776. With the war still ongoing, demands for government reform resulted in the Massachusetts Constitutional Convention of 1778, but the text proposed by the legislature failed in a statewide voter referendum. The Massachusetts Constitutional Convention of 1779–1780 was held by a specially-elected body, and the resulting text, after amendment and ratification, became the current state constitution. The State House News Service is an independent privately owned wire service based in the Massachusetts State House that provides comprehensive coverage of the Commonwealth's government. ^ John A. Hird, Power, Knowledge, and Politics: Policy Analysis in the States (Georgetown University Press, 2005), p. 93. ^ a b Robert B. Hackey, Rethinking Health Care Policy: The New Politics of State Regulation (Georgetown University Press, 1998), p. 123. ^ John Hudak, Presidential Pork: White House Influence over the Distribution of Federal Grants (Brookings Institution Press, 2014), p. 202 ("Democrats frequently control a supermajority of both houses of the state legislature in Massachusetts"). ^ Jonathan Cohn, Democratic supermajority not so super: Lawmakers from same party but not on same platform, Commonweal (May 27, 2017). ^ Jennie Drage Bowser & Gary Moncrief, "Term Limits in State Legislatures" in Institutional Change in American Politics: The Case of Term Limits (eds. Karl T. Kurtz, Bruce E. Cain & Richard G. Niemi) (University of Michigan Press, 2007), p. 11. ^ Sara Rimer, Top Massachusetts Court Overturns Term Limits, New York Times (July 12, 1997). ^ Full- and Part-Time Legislatures, National Conference of State Legislatures (June 14, 2017). ^ "Women in State Legislatures for 2018". National Conference of State Legislatures. 2018-03-14. Retrieved 2018-05-24. ^ a b 2010 Constituents Per State Legislative District Table, National Conference of State Legislatures. ^ "A tale of 3 Speakers - Salvatore DiMasi, Thomas Finneran and Charles Flaherty: Is lure of power too tempting? ", Associated Press (July 4, 2011). ^ Fox Butterfield, MASSACHUSETTS LEGISLATORS BALK AT LEADERS' POWER, The New York Times (December 10, 1983). ^ "How an Idea Become a Law". Malegislature.gov. Archived from the original on 2012-05-24. Retrieved 2014-05-13. ^ "FIRST NATIVE AMERICAN LEGISLATOR ON BEACON HILL". The Barnstable Enterprise. June 1, 2012. Retrieved January 29, 2018. Noah Bierman. "Legislators' vital work veiled from public's eye". The Boston Globe, July 8, 2011. 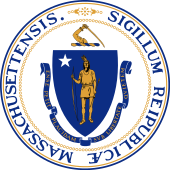 Wikimedia Commons has media related to Massachusetts General Court. This page was last edited on 31 January 2019, at 04:08 (UTC).